The Viktor Frankl Special Needs School from Aachen approached our DVS Student Group with a request. The pupils wanted to play e‑hockey (electric wheelchair hockey). 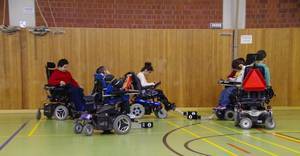 Special hockey sticks which are firmly mounted on the wheelchairs are needed for this purpose. 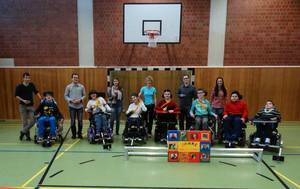 At the end of October 2015, we therefore visited the pupils in a sports lesson for an exhaustive exchange of ideas with them and their sports teacher. We quickly realised: Their wheelchairs are also as individual as the pupils themselves. Anyway, this proved to be a great challenge. Because we ultimately wanted to build universal hockey sticks which can be mounted on any wheelchair without any great scope of work. Since all wheelchairs have at least a footrest irrespective of the manufacturer and the model, we decided to fix the hockey sticks on the footrest and began to design and fabricate a first prototype. After around one month, this was put through its paces by the pupils and provided us with valuable conclusions for further optimisation measures. For example, it turned out that some of the pupils had extremely restricted vision due to the table. Accordingly, the stick with which the ball is controlled must be located further in front of the wheelchair in the case of these pupils. In the final embodiment, the hockey stick can be fixed on the existing footrest easily and quickly using knurled screws and a clamping fastening. 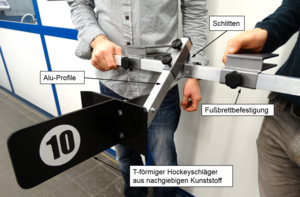 With the aid of aluminium sections in various lengths and a moving slide, the hockey stick can be flexibly adjusted to the pupil's individual wheelchair as well as to his/her field of vision. The actual hockey stick with which the ball is controlled has a T shape and is fabricated from a soft non-transparent plastic so that, in the event of a collision, the stick is only deformed elastically instead of breaking. Of course, we wanted to give the pupils a Christmas surprise with ten hockey sticks in total and two aluminium goals welded in addition. Thus, the ceremonial handover date took place in the Viktor Frankl Special Needs School on December 21, 2015 in the presence of the school management. With the aid of the sports teacher, the Student Group firstly screwed the hockey sticks on to each wheelchair and adjusted them. Within the framework of a small tournament, the pupils subsequently tested the material directly and did not go very easy on it either. However, all the pupils and hockey sticks remained intact in spite of a hard way of playing and the odd collision. The fun of playing hockey and the smiles on their faces more than rewarded us for the efforts. As a thank-you, we received a picture painted by the pupils as well as home-made tea candles and a chocolate calliper gauge. And on top, an invitation to a hockey tournament called "Pupils Against Students" in 2016. We are very curious about who will emerge from the game as the winner. In any case, we are expecting little prospect of success because the pupils have already shown very impressive manoeuvres during the trial tournament. However, we will report on the result without delay. Finally, we would like to thank the large number of supporters and voluntary helpers. 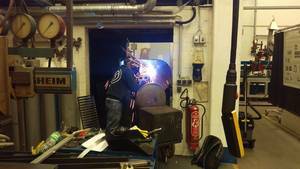 During the fabrication, we were energetically supported by the mechanical workshop of the Welding and Joining Institute as well as by the Vocational Training Centre at RWTH Aachen University. We were grateful to receive numerous material donations from companies in Aachen, including: WERTZ Handelsgesellschaft mbH & Co. KG, Erich Frank Schrauben Metall- u. Normteile GmbH, the lnstitute of Plastics Processing as well as FACE-Textil. Hans-Erich Gemmel & Co. GmbH from Berlin also supported the project with material discounts. Apart from the material donations, all the other costs were covered by the DVS district branch in Aachen. Where there's a will, there's a steak too. The story of "Smokin' Joe". Everything began with a dream. During the winter time, there was an ever greater yearning for a freshly barbecued steak. A standard barbecue is available at the institute at all times. In the meantime, this is no longer sufficient for the maximum barbecue enjoyment. Thus, there were deliberations about purchasing a new one for the most diverse events. It was to be a smoker which can not only provide first-class barbecue enjoyment but is also optically unequalled. New enthusiasm was only kindled via the DVS Student Group and, within the framework of a kick-off meeting, May 1 was thus chosen as the effective date for the new project. Eight barbecue-mad students (from different courses of technical studies and semesters) from the DVS Student Group took part in the project. The project work was based on specifications which were agreed upon with the DVS district branch in Aachen. The implementation in practice began after a three-week planning phase in which concepts, ideas and the material procurement were clarified. Either every participant could handle the required tools or our team undertook in-depth training in the handling of angle grinders and welding devices. In this respect, particular significance was attached to the integration of every member of the group. Everybody was supposed to make a contribution to the smoker. During the fabrication of "Smokin' Joe", we attached particular significance to in-house fabrication. We ourselves welded, sawed, cut with angle grinders, drilled and drank everything that was needed. We only purchased the barbecue thermometer and the magnificent wooden tyres externally. After all of four weeks, Smokin' Joe was heated up for the first time and it functioned straight away. 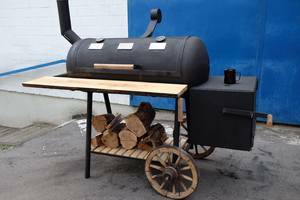 Since the project objectives demanded in the specifications were met on time, the district branch in Aachen granted a subsidy for the project conclusion party so that the completion of the successful smoker could be celebrated in an appropriate way. 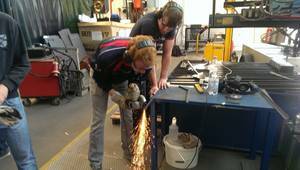 For this purpose, the DVS Student Group congregated at the Welding and Joining Institute (ISF) on a Thursday afternoon in order to begin the preparations. No less than 15 kilogrammes of pulled pork had to be marinated. Shortly before twelve (midnight), Joey was then finally heated up in an appropriate way and the shoulder of pork found its place in the cooking chamber of the smoking beauty. After a smoke-filled night, all the participants in the project conclusion party on July 3, 2015, including the members of the board of the district branch in Aachen, were able to convince themselves about the seal of quality called "Weld by DVS". We would like to express our absolutely sincere gratitude to DVS for the financial support for the project. We would also like to thank ISF for the specialist support and for the rooms and the technical resources which were made available. For all the participants, it was an absolutely special experience not only as far as the taste was concerned but also to be a part of this wonderful project which will provide a lot of nice smoker events in the future too.